One of the key ingredients I do not want in my shampoos or conditioners is sodium lauryl sulfate. It’s actually really difficult to find shampoos and conditioners in your grocery store that do not contain this ingredient–I challenge you to find one hair cleansing or body cleansing soap that is free of it. (And if you do, email us, because we’d love to know.) In addition to being a really cheap ingredient (this is why grocery store shampoos and conditioners are so affordable), it’s actually not necessary to include in these products, but companies do it because it also provides a nice lather and people associate that with better cleansing abilities. Research has also shown that SLS can be absorbed by your heart, liver, and brain. Additionally, do you really want to use a product on your hair that is also contained in your regular household cleaners (detergents, all-purpose spray, floor cleaners, etc.)? No, you don’t. Stop reading this for a minute and go grab your bottle of 409 and check out the ingredient–I’ll wait. Pretty scary, huh? My absolute new favorite shampoo and conditioner is called Tahir, which means “pure” in Arabic. The shampoos and conditioners are available in 3 different scents: Peppermint, Lavender, and Sandalwood. They come in 2 different sizes: 4 oz. travel size for $4.50 each, or the 13 oz. for $21.99 (Sandalwood scent) or $19.99 for Lavender and Peppermint. To assure the quality, each batch of the base shampoos and conditioners are hand mixed and carefully inspected during the process to ensure consumers receive the absolute best product possible. Each of the scent options was appealing to me, but I requested to try Peppermint. The scent was strong, and I am now daily reminded of a smell that I associate with Christmas. 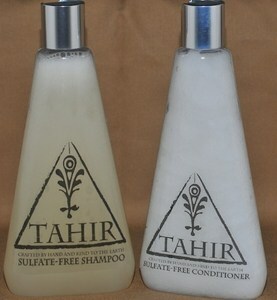 Even though Tahir contains no sulfates, the shampoo does still lather. I simply rub it in my hands and add a bit of water before working it into my hair. I was pleasantly surprised at the tingling sensation to my scalp–it felt like I was getting a head massage. Pure bliss! The tingling feeling even lasted for quite awhile after I had existed the shower. Though I don’t know if this is a result of the shampoo and conditioner or I had just spent extra time trying to blow dry my hair straight, I didn’t notice much frizz at all. My hair stayed fresh looking all day long. When I woke up the next morning, my hair did not look greasy, so I’m pleased to say that on some occasions I am totally going to take the day off from washing and conditioning my hair. My favorite benefit of using the Tahir shampoo and conditioner is that it is perfectly safe on color-treated hair. I’ve come to the realization that it doesn’t look good when I try to color my own hair, and that I am much better off visiting a salon. When using products that contain sulfates, hair gets stripped of both color and moisture, which means more frequent trips to the salon. I’m hoping that by strictly using Tahir products, I can space out the trips I’ll need to take to get my hair colored. In addition to shampoos and conditioners, Tahir will also be offering shaving cream, body washes, and other personal care products in the future. I can’t wait until this expansion happens! I will definitely be replenishing my supply of shampoo and conditioner when it runs out. The lavender conditioner would be great. I’d like to try the lavander shampoo. I would love the opportunity to try the Lavender Shampoo–Sulfate and Gluten Free. I’d love to try their lavender shampoo! I’d love to try their Lavender Shampoo & conditioner! I would love to try the Lavendar Shampoo and Conditioner. That is my favorite scent! I would love to try the lavender shampoo and conditioner. The lavendar shampoo sounds like something I would like to try. I’d like to try the Lavendar Shampoo. The scent of Lavendar has always soothed me. I would like to try their Lavendar shampoo! I want to try the Sandalwood Shampoo. Thanks for the giveaway…we would like to try the Sandalwood Shampoo.